A stunning modern property, well situated within walking distance of amenities. Sea views & valley views to the south, vineyard and country views to the north. Spacious and light with all modern conveniences including air conditioning in all bedrooms, wifi internet and UK satellite television and pool table. Short drive from the centre of Moraira village and the beach. 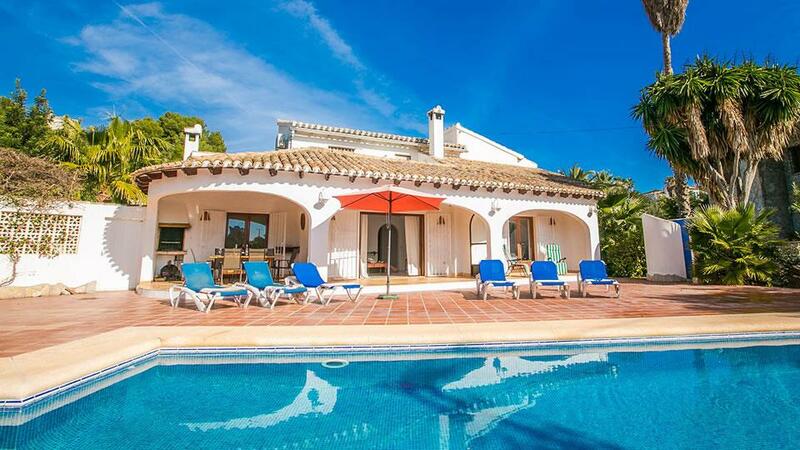 Villa's Like Allessandra are rarely available for rental in the Moraira area. Designed by the owner it offers spacious and light accommodation throughout with many thoughtful features. It offers wonderful views to the sea, valleys and to the North to vineyards and the contemporary design of the property ensures that the views are available from almost every room, even the large feature bath in the master suite. Tastefully furnished throughout it features air conditioning in all bedrooms, wifi internet throughout and UK satellite TV channels with a 40" LCD flat screen television. It also benefits from being well ideally situated from enjoying country walks overlooking the vineyards and less than a ten minute stroll to the Tabaira commercial area with a supermarket and a coiple of restaurants and bars. 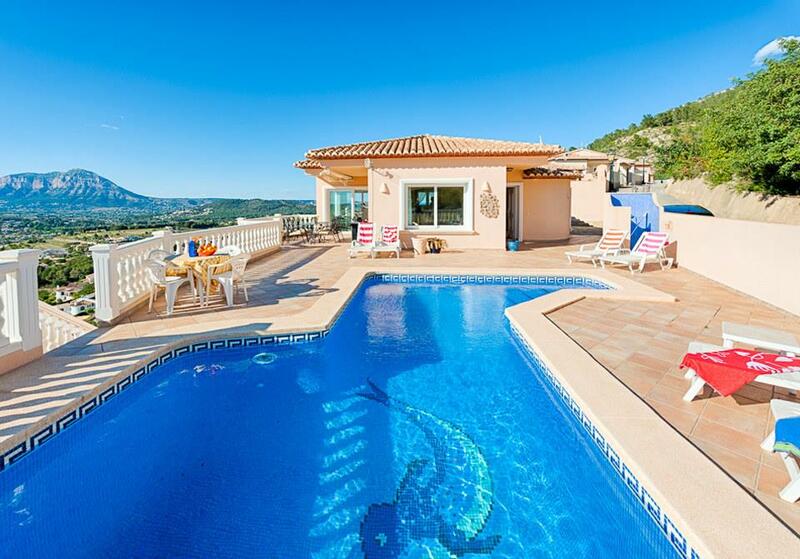 It is also only a five minute drive from the centre of Moraira and the beach. The rear gardens feature a large private pool, artificial lawns with shrubs and trees and a large shaded terrace overlooking the pool. Highly recommended. Entrance to the villa is via either the remote contol electric driveway gate or pedestrian entrance gate. The driveway has a wide 5 meter gate and space for two to three vehicles.Two steps from the front pathway lead up to the entrance porch and into the villa via the front door. The impressive entrance hall features a 7m high ceiling with almost floor to ceiling glass to both the South and North of the property, stairs lead up to a galleried landing. The hallway is open plan to the modern kitchen and living space. The kitchen features a central island with large gas hob, american fridge/freezer, dishwasher, washing machine, integrated coffee machine and oven/microwave with grill. Along from the kitchen is the living - dining area with flat screen TV, UK satellite and DVD player. There is a dining table for six people. Tri-fold doors from the hall, the kitchen and patio doors from the lounge all lead out to the shaded naya which overlooks the pool. To the right side of the entrance hall are two bedrooms and a bathroom. Both bedrooms have twin single beds and are air conditioned, with wardobes. One of the two double bedrooms has patio doors leading out to the naya the other has double windows over looking the front garden. Both bedrooms, the kitchen and the living area have electric blinds and integrated mosquito nets. The shared downstairs bathroom features a large shower, toilet and sink. A large dog-leg staircase leads up to the galleried landing and two further bedrooms. The master bedroom is very spacious and has large feature windows to the South with spectacular views across the valley to the sea and patio doors to the North with wonderful country views over the vineyards. The master bedroom has a queen size bed, large wardrobes and electric blinds. The en-suite bathroom in the master bedroom has a large sunken bath with views from the bath to the sea, double sinks, toilet and shower. Patio doors lead out to a small terrace to the North and a single door leads out to a large private terrace with spectacular 180 degree views over the surrounding houses, valley and the sea. The second spacious upstairs bedroom has a standard double bed and a single bed, it is air conditioned and has an en suite bathroom with shower, toilet and sink. This second upstairs bedroom also has its own private terrace offering spectacular views, accessed through patio doors from the bedroom (for children's safety this door patio is lockable with a key if required). The outside naya has two dining tables and steps to the left and the right lead down to the rear gardens which feature a lawned area (artificial grass) . The large private pool has roman steps at the shallow end and measures 11m x 4.5m and has remote controlled pool lights that offer a variety of colours and patterns for an amazing night time ambiance. The garden is very safe and has been designed with children in mind. The rear garden can also be accessed directly from the driveway area. Ample sunbeds are provided, a barbecue, pool table and ample comfortable sunbeds. Wifi internet is also available throughout the property. The property is one of a few in Moraira situated in an area with pavements and street lighting, it is possible to walk out into the countryside and the Tabaira commercial area with supermarket, bars, restaurants, bakery and newsagent is less than 10 minutes easy walk. Less than a 5 minute drive from the villa is a new commercial area with Carrefour and Lidl supermarkets and in the other direction Moraira town and beach. 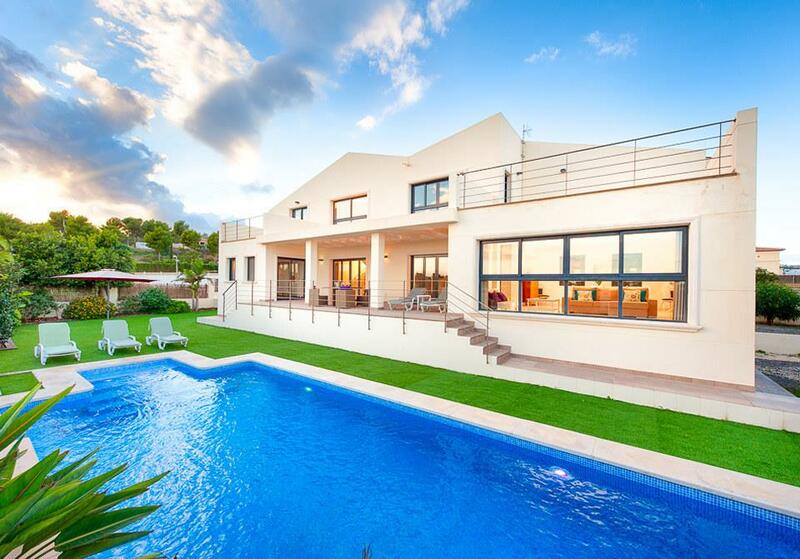 Lovely villa with beautiful outlook. 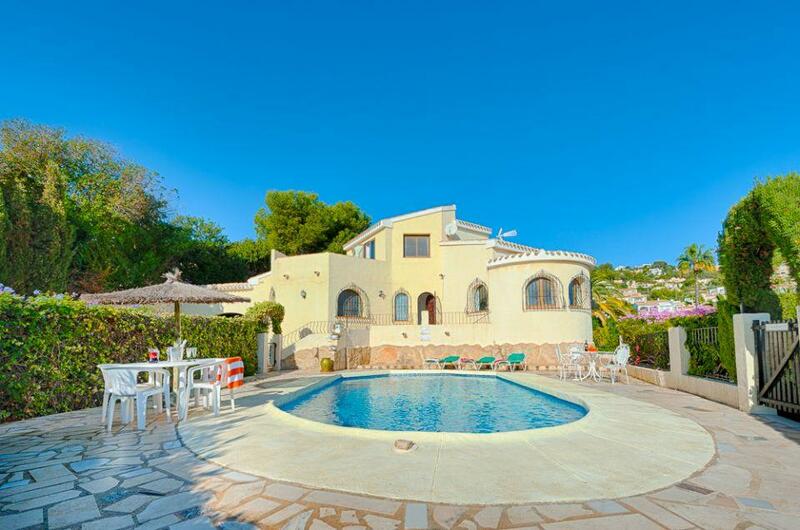 The location of Villa Allessandra is in a quiet residential area just outside Moraira. This was ideal for us as we had lots of privacy which is what we preferred rather than being in the heart of everything. So a car is a must to be able to get to supermarkets, into town and explore the surrounding area, but it’s just a short drive to all these locations. The villa is very large and spacious and the open plan design in the kitchen and front room allows for everyone to be able to interact with each other. The views are beautiful and you get to see the sunrise and sunset and the pool area gets the maximum amount of sun all day. The outside area is lovely with AstroTurf surrounding the pool area which is so much better than that standard concrete flooring. Overall we would highly recommend this villa and we had a wonderful time there.